If they so much as harm a hair on Miranda *insert middle name* Bailey-Warren's head all hell will break loose! What happens when the backbone of Grey's Anatomy has a heart attack? The GSM family will never be the same, that's what happens. There is so much going on with Miranda. She's running the hospital, which is a hard job in and of itself, especially when that hospital is Grey Sloan Memorial. She has a host of doctors who are deadset on giving her gray hairs, and she has a small child too. Then, of course, there's the fact that Ben is taking on a new position that we'll see more of on Station 19. Miranda Bailey has a lot on her plate and a lot to be stressed about. Unfortunately, it's all going to catch up to her on Grey's Anatomy Season 14 Episode 11. 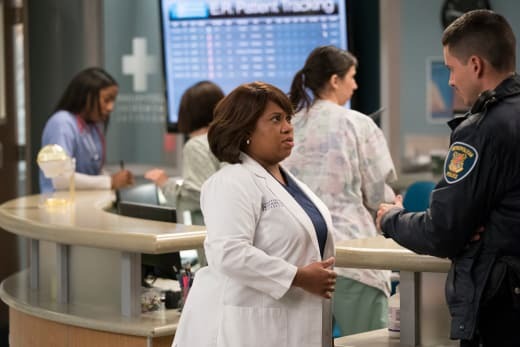 Grey's Anatomy had a sweep of deaths on Grey's Anatomy Season 14 Episode 10, but they haven't killed off a beloved main character in quite some time. Could this be the end of that streak? Hopefully not! Check out the promo for "(Don't Fear) the Grim Reaper" below! Grey's Anatomy Season 14 Episode 11: "(Don't Fear) the Reaper"
Miranda Voiceover: It’s not about whether you spend your life in a boardroom, your bedroom, or on a beach with a Mai Tai in Maui. When you look back on your life, the only thing that matters is: Did you spend it doing what you love? With the people you love? Were you happy? Did you make the most of this beautiful, terrifying, messed-up life? Did you let go of all the things that held you back? So you can hold on to what matters most? Life is too precious to waste doing anything less than what makes us happy. Permalink: Life is too precious to waste doing anything less than what makes us happy, you get to be happy! Grey's Anatomy Round Table: Finally, A Miranda Centric Episode!